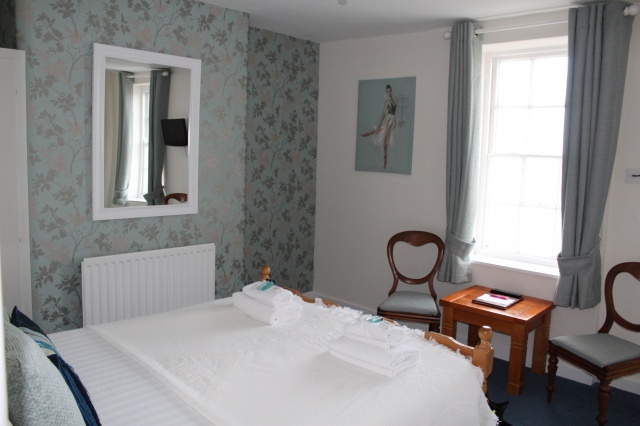 Redcliff Guest House have a wide range of rooms which can cater for all, whether you are coming to Weymouth for a romantic weekend, a week long family get away or a one night business trip we have a room to suit your needs. We are located in a quiet cul-de-sac, close to the beach and just a short stroll away from the night life and great Weymouth restaurants. You can be sure that staying at Redcliff Guest House will provide everything you may need for your holiday or business trip. All our rooms are en-suite, 6 of these have stunning sea views of Weymouth bay and you only have to cross the street to beginning building sand castles. We are a pet and child friendly under 6s stay for free. 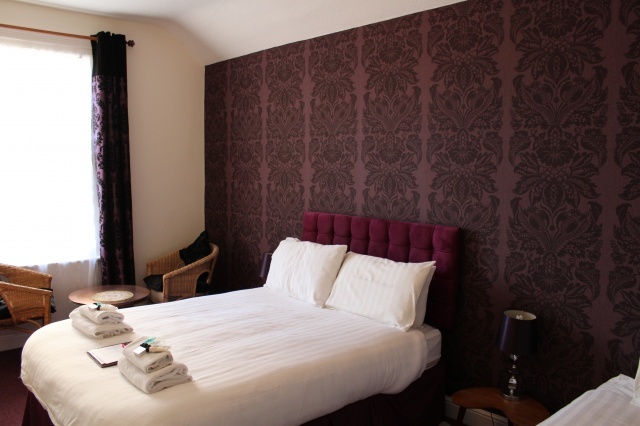 We have a room to suit everyone including - Family rooms, Twin rooms, Singles and Doubles, All our rooms are En-Suite. Room 9 and 10 are perfect for a larger family will accommodate a maximum of 2 adults and 2 kids room 9 is a twin room, while Room 10 is a double and are opposite each other. An extra bed can be added to rooms 12 and 6 to accommodate a maximum of 3 guests. Family room, Double or Twin with en-suite. Located on the first floor. Sleeps a maximum of 3 people. Double en-suite. Compact and bijou stylish double with a small functional en-suite. Single occupancy available. Sleeps a maximum of 2. Double room with en-suite. Spectacular sea views from the bay widow. Sleeps a maximum of 2. Single or Small Double with en-suite. Single occupancy available. Sleeps a maximum of 2. Double room with en-suite. Sea view room. Located on the second floor. Large enough to facilitate a single bed, at an extra cost, if required. Please contact us directly to arrange. Sleeps a maximum of 3 plus a travel cot. Double room with en-suite. Amazing sea views. Located at the top of the house. Accessed via steep final flight of stairs. Sleeps a maximum of 2. Family, Double or Twin with en-suite. Located on the first floor. Sleeps a maximum of 3 people. Single en-suite with open bathroom. Can accommodate an extra bed perfect for one adult and one child. 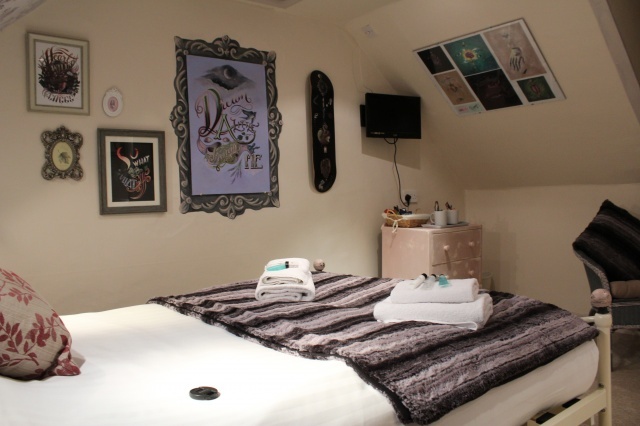 Can be booked with room 10 to accommodate a family of up to 4. Double Room with en-suite. Sea view room with bay window. Sleeps a maximum of 2 but can accommodate a travel cot, if required. can be booked with room 9 for a large family. 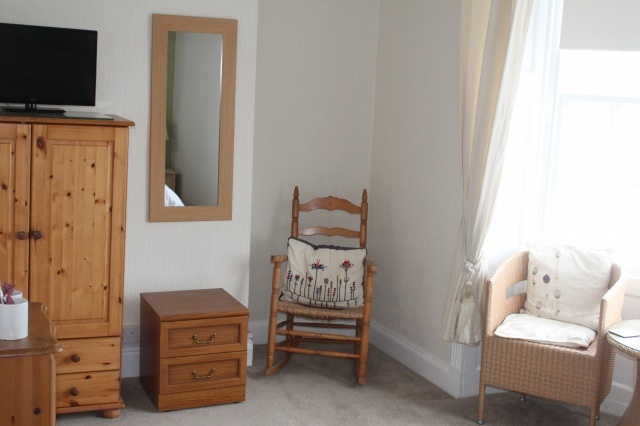 Double room with en-suite. Located on the second floor with sea views. Large enough to facilitate a single bed, at an extra cost, if required. Please contact us directly to arrange. Sleeps a maximum of 3 plus a travel cot. Double room with en-suite at the top of the house, with a steep end climb to a room with a view. Local artist, Remy Nurse has put her own signature on this themed room. Sleeps a maximum of 2. 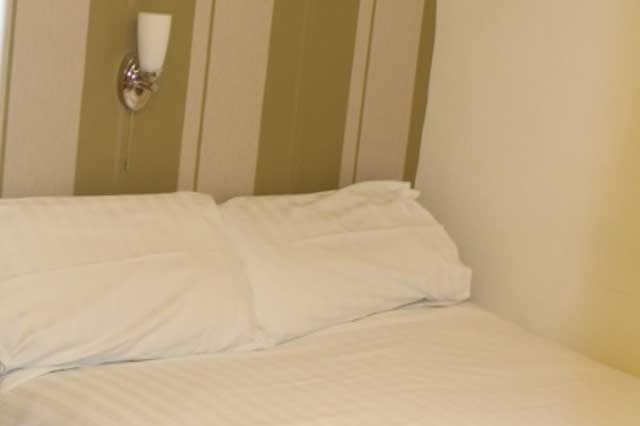 All of our rooms come with the amenities that you may expect, including; toiletries, towels, Free-view TV, hair dryer, tea and coffee making facilities and very comfortable beds. Some of the rooms have a DVD player to entertain the kids when the British weather strikes. Our room rates include breakfast, served in our breakfast room which has a sea view There is a large range to choose from for breakfast. Including continental, vegetarian or full English as well as juices, yoghurt's, cereals, porridge and kippers. Special dietary requirements can be catered for. And, of course, John's increasingly infamous Full English, a great way to start the day before you see everything that Weymouth has to offer. If you would like any more information regarding Redcliff Guest House then please feel free to get in touch, we will be happy to answer any questions you may have.